It's not just a fight for attention out there. It's also a battle for credibility. Who's best at what you do - you or a competitor? Whose clients are willing to publicly endorse you? Lowndes is a forward thinking law firm with a strong commercial pedigree. They host regular, in-demand workshops led by some of the top people in various fields. The workshops are unfailingly interesting and thought provoking. Lowndes rely on Department of Writing to summarise the content of each workshop for a follow up newsletter. Newsworks wanted to demonstrate how newspaper advertising could play a central role in helping a retailer cause breakthrough business results. 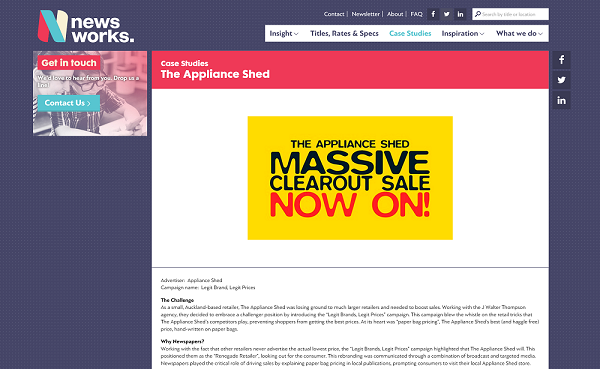 This short case study did the job elegantly and powerfully. Intergen are one of Australasia's leading IT services companies, trusted by business and government organisations on both sides of the Tasman. They regularly turn to us to showcase their successes in helping clients harness technology for greater efficiency and better business outcomes. Fisheye are a smart IT company who deliver surprisingly impactful results for their clients. We helped them showcase work done for one of New Zealand's leading PR agencies as well as one of the country's most important pastoral farming organisations.